Search for China Hotels, please insert keywords, ex:" Beijing Exhibition " , and clic the "Search Hotels" button. below list of result search, offer by ChinaHotels.org. Book online, no credit card needed. from the city center: 0 KM; from the railway station: 5 KM; from the airport: 35 KM, from North Exhibition Center: 8KM; - Beijing Xuanwumen Business Hotel is a 3 star intelligent business hotel. Located in Interchange of downtown Metro Line 2 and Line 4 Xuanwumen Station, Media Boulevard first position, adjacent to the sogo business district, Xinhua News Agency, International Media Centre and the Press and Publication Administration, and the Tiananmen Square is within walking distance from hotel, near prestigious glass market culture street and Quanjude Roast Duck Restaurant. The hotel is very near to the Beijing International Airport, about 2.5 km, 10 minute drive. They will arrange free airport pick-up service upon requested. About 30 minute drive from the Beijing Rialway Station. About 15 km to the Beijing International Exhibition Center. 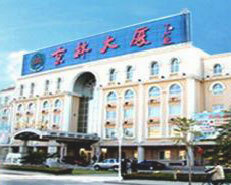 - The Hotel is located on the southwest part of the Beijing Capital Airport, about 2.5 km away. 20-kilometers from the Beijing Capital Airport; 8-kilometers away from Beijing railway station; 10-kilometers away from Wangfujing Avenue; 10 kilometers away from city center; 1.5 kilometers away from Beijing Lufthansa Center. 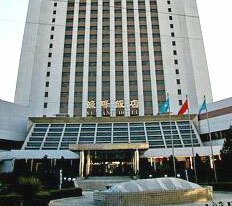 - Beijing Yong'an Hotel was established in 1987 by Beijing Tourism Administration and has an area of 17,000 square meters. The hotel with five buildings of accommodation and courtyard and garden, is a business garden hotel welcomed by businessmen.